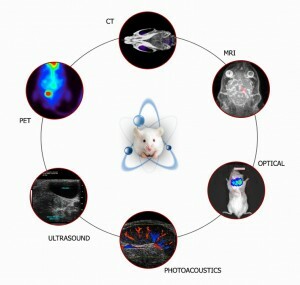 MIC’s Preclinical Imaging Core is dedicated to research studies of small animals for a variety of applications. The Core facility is staffed with trained machine operators and animal technologists. MIC faculty are active in developing novel methods of imaging to obtain new types of information as well as in applying current methods to study a wide range of biomedical questions. The pre-clinical versions of PET, CT, Ultrasound scanners in our facility provide information from studies in pre-clinical models, which can be directly translated to clinical settings. In addition to the structural and functional data provided by each instrument listed below, supplemental data can also be acquired using autoradiography and biodistribution studies. In addition, optical imaging studies provide gene reporter analysis using transgenic models or tumor cell lines with luciferase or fluorescence measurements of labeled molecule distribution using quantum dot nanotechnology. The Molecular Imaging Laboratories at USC are an adjacent, shared-use vivaria and animal holding facilities. These facilities are supplemented by an image processing laboratory on the first floor of the same building, as well as a PET clinic and a biochemistry laboratory in other buildings on the USC Health Sciences campus. The Small Animal Imaging Laboratory (1200 sq. ft) comprises two adjacent rooms. Equipment housed in the Laboratory is highlighted below, a more detailed description of the imaging modalities is provided in the Equipment section. PET images are acquired from from rats, mice by recording high-energy γ-rays emitted from within the subject. The source of the radiation comes from positron-emitting-bound biological molecules, such as 18F-FDG (fludeoxyglucose), which is injected into the animal. MRI exploits the nuclear magnetic alignments of different atoms inside a magnetic field to generate images. MRI machines consist of large magnets that generate magnetic fields around the target of analysis. Ultrasound imaging works through the generation of harmless sound waves from transducers into living systems. As the sound waves propagate through tissue, they are reflected back and picked up by the transducer, and can then be translated into 2D and 3D images. Demo ContentPhotoacoustic imaging is a new in vivo hybrid imaging modality that combines the sensitivity and contrast of optical imaging with the depth and resolution of ultrasound. When pulsed laser light illuminates tissue, the optical absorbers there (such as hemoglobin) undergo thermoelastic expansion, generating an acoustic pressure wave which is detected with an ultrasound transducer. Fluorescence Imaging - works on the basis of fluorochromes inside the subject that are excited by an external light source, and which emit light of a different wavelength in response. Bioluminescence Imaging - on the other hand, is based on light generated by chemiluminescent enzymatic reactions. In both fluorescence and bioluminescence imaging. Offers multilabel counting efficiencies for more sophisticated research applications such as PET. This single detector, universal counter sets a new standard in background reduction. • Aid in labeling tracers/drugs with fluorescence or biologics with radiometals for in vivo studies.